Last year I was employed as a consultant at an interior design store. 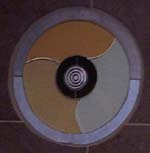 One day, Lucille Blydenstein, an interior designer, approached me about making circular tile patterns for her clients’ shower. The clients were building a new home in a beautiful location above the Strait of Juan de Fuca in Port Angeles, Washington. The contemporary design that they had chosen was a marvelous change from the new construction projects I typically worked on, and I was excited about being a part of their innovative project. Lucille showed me the wallpaper, glass, and metal tiles that she intended to use. She wanted three circles, with diameters of three feet, two feet, and one foot, to accentuate her overall design. With that information I went to my Glass Eye 2000 program. I love how I can doodle with different ideas, and quickly erase mistakes or make necessary adjustments. If I had to draw these designs by hand the process would be too time consuming. I needed to come up with an initial pattern, so after some experimentation I printed out my Glass Eye 2000 design and presented it to Lucille. She loved it and so did the clients. The expense of glass tiles made the cost of the project exorbitant. I knew what colors they wanted, so I found marble and limestone tiles that were more affordable and substituted them for some of the glass tiles. I have an industrial band saw that has been converted to a wet saw; it's equipped with a diamond band saw blade to cut a variety of curves. The next step was to design each circle and print out the patterns for the clients to approve. I decided to tackle the largest circle first and came up with the perfect combination. After the first circle was approved they let me create whatever I thought best for the other two. 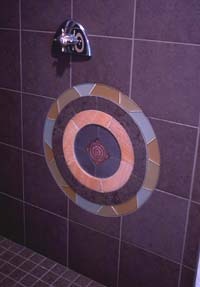 In those designs I incorporated a 100-year-old, 4x4 glass tile with the same bulls eye design as the 2x2 aluminum tiles I used in the largest circle. Glass Eye 2000 has been essential in allowing me to print out my designs so that customers can see them at actual size and color. Not everyone can visualize the finished product based on rough sketches, and the software has had a tremendous impact in showing my customers what I can make for them. I love to create, but drawing can be a challenge. Glass Eye 2000 has allowed me to turn my ideas into reality. Since the completion of this project I have become a full-time tile installer so I can enjoy the entire process from design to installation. I love the creative possibilities of the material. With Glass Eye 2000 Professional Edition I have been able to create original designs and to share them with my clients. When tiles no longer have to be square there is unlimited creative potential! 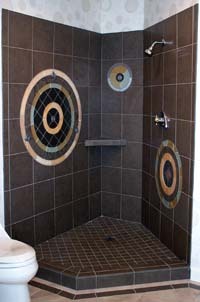 Lynda is co-owner of D&R Construction, a tile installation company. She took her first stained glass class in 1981 and, like so many others, was hooked after the first break of glass. In 1993 she worked at an interior design store and soon became their ceramic tile specialist. Lynda enjoys taking the time necessary to create unique custom designs, but she also knows how to work within a budget. 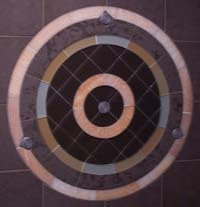 If you have a tile project to discuss, please write to her at lynda@olypen.com.